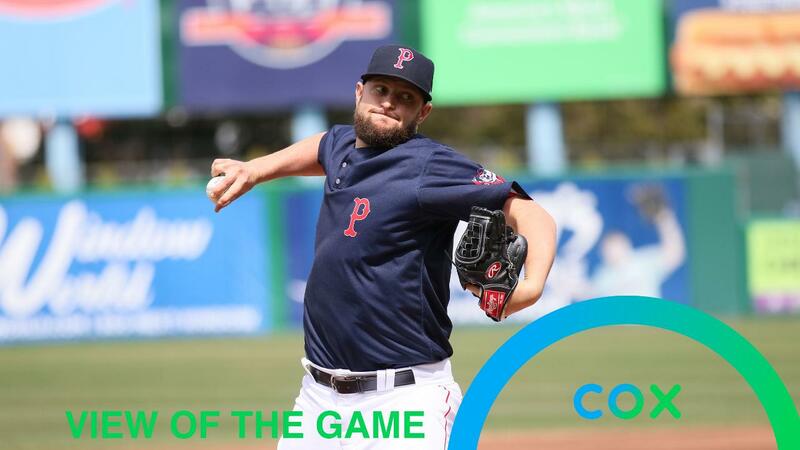 PAWTUCKET, R.I. - Thanks to an excellent start from Josh Smith (W, 1-0) and home runs from Michael Chavis (3-for-4, HR, 2 R) and Rusney Castillo (2-for-4, 3-R HR), the Pawtucket Red Sox (5-4) took game three of their four-game series with the Syracuse Mets (6-4) Saturday afternoon by a final of 7-2. The PawSox jumped on Mets starter Chris Flexen (L, 1-1) in the very first inning. Chavis blasted a 470-foot home run that went over the berm in left-center field that left the bat at 112 miles-per-hour. For the second straight game, Travis Taijeron (3-for-4, 2 HR, 2B) got the Mets on the board with a home run, this one tying the game at one in the fifth inning. Pawtucket immediately regained the lead in the bottom half of the fifth. Nick Lovullo (1-for-3, RBI, R) lined an RBI single to make it 2-1. Two batters later, Castillo mashed a three-run, opposite field home run to make the score 5-1. In the seventh inning, Taijeron hit his second home run of the game (and his third in eight plate appearances in the series) to make it 5-2. The PawSox added a pair in the eighth on a sacrifice fly from Bryce Brentz (0-for-3, RBI) and an RBI single from Cole Sturgeon (2-for-4, 2B, RBI). In his second start of the season, Smith was superb. He went 6 innings allowing just 4 hits and 1 run without walking a batter. Smith struck out 10, setting a new International League career-high for him. The Pawtucket pitching staff (Smith, Domingo Tapia, Josh Taylor, and Jenrry Mejia) combined to strike out 13 Mets, which tied a season-high. The PawSox conclude their four-game series with the Mets on Sunday at 1:05 p.m. Pawtucket right-hander Ryan Weber (0-0, 4.50 ERA) is scheduled to oppose Mets righty Zach Lee (0-0, 16.88 ERA). The game will be televised live on myRITV, and radio coverage on WHJJ (920 AM and 104.7 FM) and throughout the PawSox Radio Network begins with the pre-game show at 12:35 p.m.